StoreWALL offers a great range of Garage storage shelving systems which can be attached to our StoreWALL Wall Panels and easily moved around. The range comprises plastic and metal garage wall shelves of 800mm or 1.2m lengths. StoreWALL Metal garage wall shelves come in 1219mm and 760mm sizes and are made from solid industrial grade steel, with a steel reinforcement bar on the underside. Our Metal Shelves will keep all your items safely stored. All of our Metal Shelves also come with CamLok backplates and are coated with a heavy duty powder finish. Compliment your StoreWALL panels with our new light weight plastic shelves. The 812mm & 1219mm shelves are made from a sturdy plastic and are supported by StoreWALL brackets (sold separately). One side has no edges, flip it over and it is a tray with a lip edge all the way around. The shelves have a maximum weight capacity of about 45kg. The 1219mm Ledge Shelf fits directly onto your StoreWALL wall panels (no brackets required). Shelves are moulded of strong, lightweight thermoplastic, do not require paint or finishing and are simple to keep clean. The Ledge Shelf can easily be converted into a custom display shelf or tool organiser. 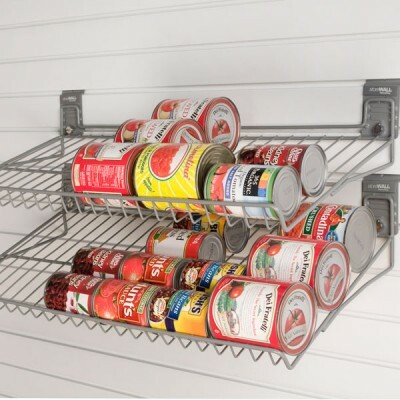 StoreWALL offers two Wire Shelves (Small and Large). The Large Wire Shelf (760mm) provides more space for storing a wide variety of supplies and is perfect for places where brackets cannot be used. A great place to store muddy boots and boxes off the floor. The Small Wire Shelf (760mm) is designed for storing items such as a tackle box, small cooler or a tool box. Wire shelves are equiped with our CamLok locking mechanism. 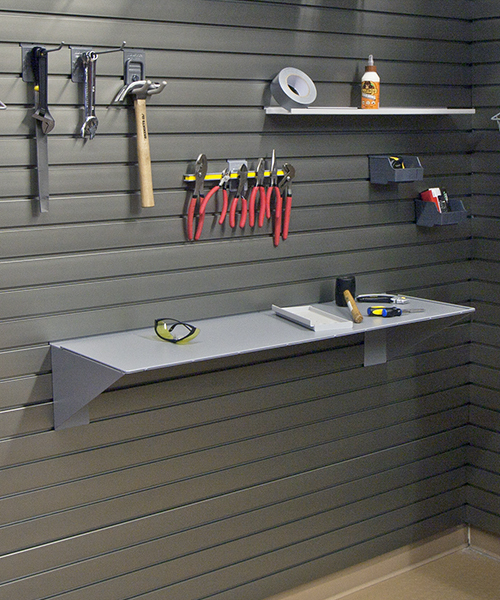 Our garage workshop storage solutions now extend to our tool organiser. Made of extruded, lightweight thermoplastic, pre-drilled and ready to use. The 406mm Tool Organiser is incredibly strong, easy to clean and does not require paint or finishing. It also attaches easily to StoreWALL without additional brackets. All of our shelving options can be found here.